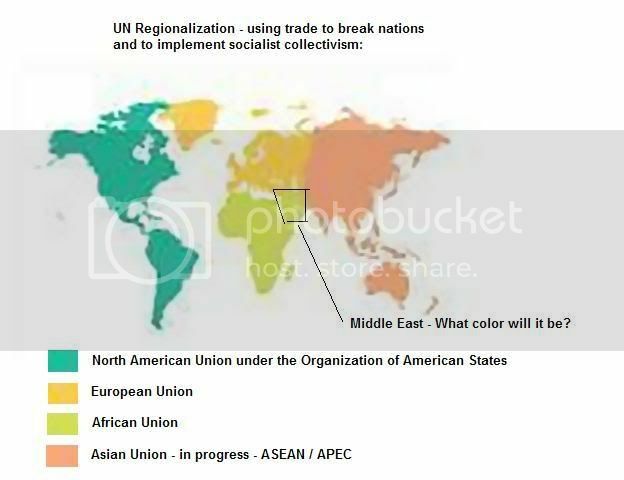 There is a conspiracy theory out there suggesting there will be an African Union, a North American Union, a European Union (which exists) and an Asian Union. Once this phase is completed, we move onto a one-world Government. well yes. Look at how nafta(along with "free" trade with china) has all but destroyed our manufacturing base. Also when they pushed through nafta-one of the "selling points" was that it was going to stop the illegal alien invasion. The beginning plans of the EU started prior to WWII. People who talked about it back then were labeled with titles like "conspiracy theorists" as well. And the Government tried to make it seem like the NAFTA high was a conspiracy. Turned out to be true, so I wouldn't be surprised if all this one-world government stuff would be true as well. How true! The same label they ascribe to us because we aren't sheeple being blindly led to the slaughter. Agreed. There are pictures of the highway being built, public meetings for those affected by the NAFTA superhighway yet some still deny it is being built.